Our readers all know the back story: President Obama, Senator Michael Bennet and Democrats in general have for 3 years ridden the bogus birth control issue the way that Sandra Fluke rides the…ummm…pony. There wasn’t a Republican in Colorado last year who wasn’t accused of wanting to steal the pill from the purse of every woman as part of a wider vendetta against the reproductive rights of the girl next door. This accusation was usually tied to Republican opposition to a provision in Obamacare that eviscerated the Catholic Church’s moral stance on birth control issues. Most Republicans that we know share the same view of birth control access as many liberals — your business, you should have access to it, we don’t care, and it certainly isn’t government’s business. But Republicans don’t think that the federal government should cram down rules on individuals and institutions that take a different view. If that is true, then today Barack Obama — that fearless Guardian of Reproductive Rights of the girl next door — waved the white flag. The Obama administration on Friday announced a broader opt-out for religious nonprofits that object to providing health insurance that covers birth control. The administration is allowing religious nonprofits to offer coverage that does not include contraception. In such a case, a third-party issuer will handle all business related to providing birth-control coverage for women. Religious groups had said the old birth-control coverage rule violated their religious beliefs. Many filed lawsuits or said they would simply not comply. Could it be that this was all just a set-up, and all that Obama was ever really interested in was picking a fake fight over birth control in order to save his electoral arse? Of course it could be. 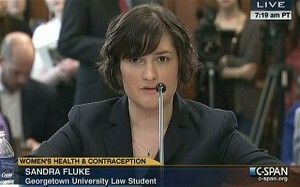 Sandra Fluke, who became the embodiment of the Democrat talking point on mandatory birth control coverage, must feel so used. No self-respecting woman would stand for it. Which means Ms. Fluke probably will. Just wait untill all of the folks start to pay the bill? Saw a post on another site where Cabelas lists there Obama care tax seperate and listed on your reciept. AMEN. IMPEACH EM ALL. TIRED OF ALL THE CRAP THE DEMOCRATS ARE DOING ESPECIALLY THE OBAMA FAMILY. GET RID OF EM AND SEND THEM BACK TO KENYA OR FLORIDA. WHICH EVER ONE WANTS EM.